Note: This photo and the next three photos are tintypes. Because of the nature of the tintypes, the intregrity of the image tends to become compromised if I try to clean them up too much. I cleaned up most of the black and white specs in this photo, but otherwise left it as scanned. Notice the finger prints. Tina (Katherine) Bunger was a close friend of Meta and Annie's. As this picture shows they knew each other when they were quite young. In 1905 Tina's father, Henry, kept a saloon at 224 River Street (1905 N. J. Census). Tina Bunger married William Heuer. Meta seated on left. Other's unknown. 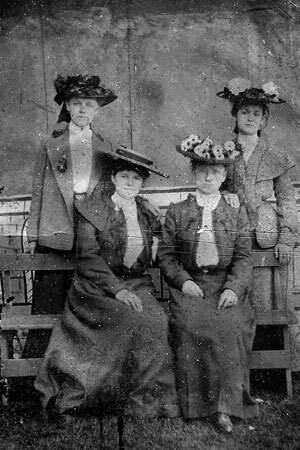 Note: I cleaned up Meta's face and blouse a little, but otherwise left this tintype as it was scanned. Meta seated on left. 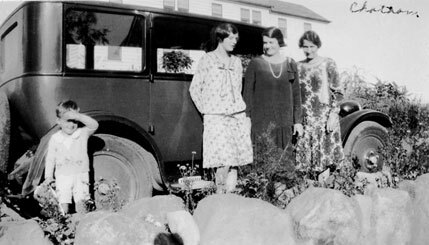 Tina Bunger, a childhood friend of Meta and Annie's from Hoboken, is standing behind her. Other's unknown. The picture on the left is as scanned from the tintype. The picture on the right was cleaned up a bit and lightened. Meta on the right. Others unknown. Note: I cleaned this tintype up around Meta and left the rest as scanned. Note: The next series of pictures are photographs. They have been cleaned up as much as possible while trying to maintain the intregrity of the photo. The woman on the left is Tina Bunger. The other women are not known. 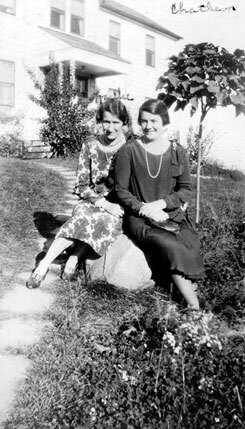 Millie on left and Annie Petermann Wulpern on right. 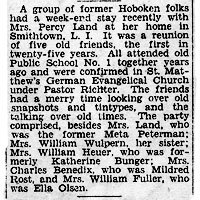 Meta Petermann Land had a reunion with her sister, Annie Petermann Wulpern, and three of their childhood friends from Hoboken on Long Island in February 1931. The event was written up in the Long Islander on February 27, 1931. 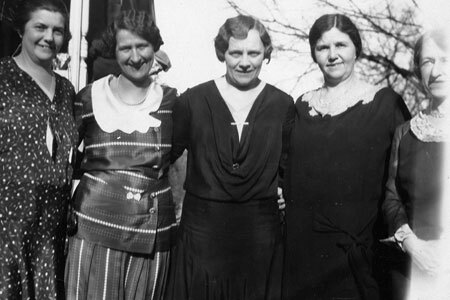 From left to right: Annie Petermann Wulpern, Millie (Mildred) Rost Benedix, Katerine (Tina) Bunger Heuer, Meta Petermann Land, and Ella Olsen Fuller. The boy peeking off the porch whose head can be seen near Millie's is Bud Land. 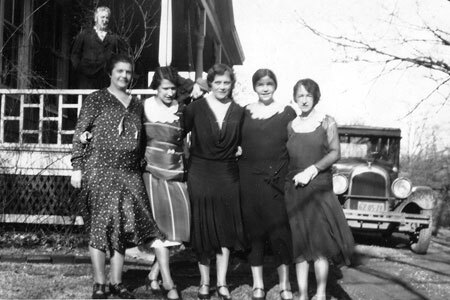 From left to right, Annie Petermann Wulpern, Mildred (Millie) Rost Benedix, Katherine (Tina) Bunger Heuer, Meta Petermann Land, and Ella Olsen Fuller. Percy is standing on the porch and some child is leaning out from the porch. His head is between Millie and Tina's heads. In this picture it is not possible to detrmine who he is. However, he is in the same possition in the photo above. In the other photo it is clear that he is Bud Land. Based on his clothing, it is the same person. 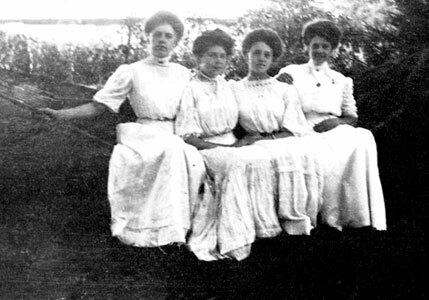 From left to right: Millie Rost Benedis, Meta Petermann Land, Annie Petermann Wulpern, and Ella Olsen Fuller. This photo was obviously cut. 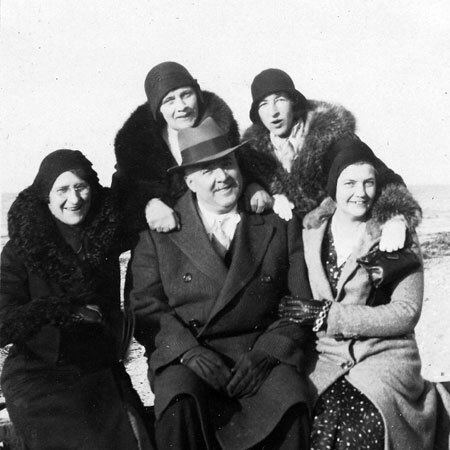 Percy Land with from left to right: Mildred (Millie) Rost Benedix, Katerine (Tina) Bunger Heuer, Ella Olsen Fuller, and Annie Petermann Wulpern. WWI draft registration: William Henry Heuer, 1020 Park Ave Hoboken, native born May 16, 1883, Stationary Engineer Manhattan Club Madison Ave, NYC, wife, Catherine Heuer 1020 Park Ave, tall, medium build, gray eyes, brown hair. Rost in Hoboken; I cannot find "Mildred" Rost in Hoboken. 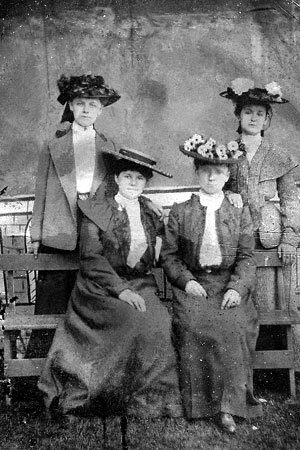 There is a Rost family in the 1900 census on River Street quite near Tina Bunger. 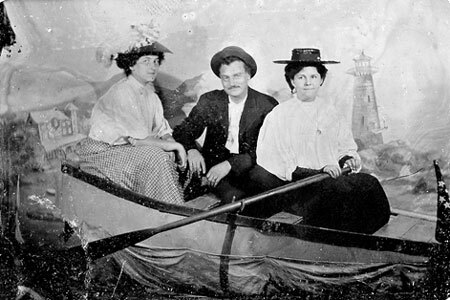 Rost, Friedt, head September 1847, age 52, married 16 years, born Germany, immigrated 1883, naturalized, horseman, Emilie wife March 1861, age 39, 4 children 3 living, born Germany immigrated 1883 Charles son Jan 1885, Emiline, daughter Aug 1888 Anna daughter Jan 1890 all born New Jersey. 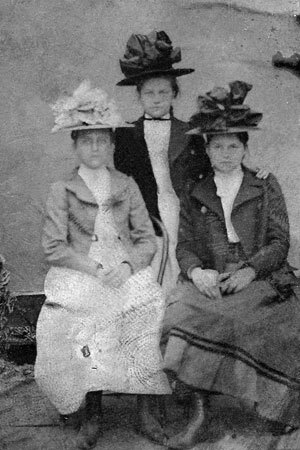 I think it quite likely that this is "Mildred" and her family. 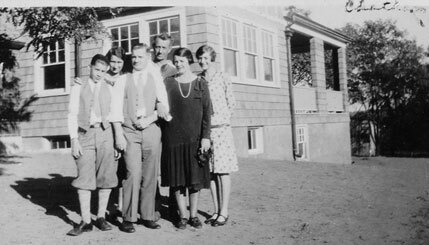 1930: Jersey City, Charles, Mildred, Edward and Irving. Hard to read Charles' occupation last part dry goods. WWII DR: Charles Alfred Benedix, 156 South Street, Jersey City, born NYC Jan 9, 1885, wife, Mrs. Mildren Benedix, occupation, Montgomery Ward & co, 75 Varick Street, NYC. I cannot find Ella in Hoboken in the 1900 census. 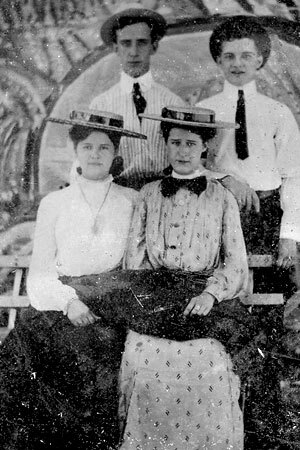 The names, Ella Olsen and William Fuller, are common. I need more information.